This picture was taken in 2014 and sent to me by Anita Rutledge. This was the last one-room schoolhouse to close after 100 years in existence. It is close to the Ontario border in southern Quebec. 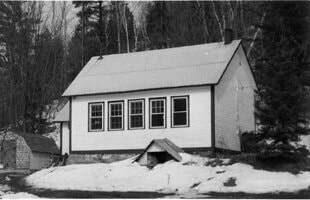 ​There were two one-room schools on the east side of the Gatineau River in Wakefield Township. One of these was Wakefield School No 1 (Stevenson) and the other was Wakefield school No. 2 (Fairbairn). The family names point to the nearby farm families who originally donated land for the schools. The Stevenson school is located on Rte. 366, opposite the heritage Stevenson farmhouse, not far from Wakefield village. The Fairbairn school is several miles north on Mountain Road, just south of the old George Fairbairn homestead. Both these schools are now family homes.